Prevailing Narrative Voice: First person. Hard-boiled. Factual. Detective genre style. Narrating events from past tense. Not straying from essential facts. What the reader learns in the first ten pages: The reader receives details of The House of Death, including the “blood red drapes that run on iron spears” and furniture that seems to have been installed directly from a classy department store showroom floor. Huff sizes up the wife of his client as she enters in a suit of day-pajamas and as they cat and mouse around the topic of automobile insurance. When she makes the mistake of – a little too causally – asking about accident insurance, Huff knows she is onto something and that he’d best stay a couple of steps ahead. Back at his office Huff is complimented by his superior for being a top-notch salesman while he keeps the company’s interest in mind. The reader is told in a fast dialogue scene that the boss is very satisfied with Huff’s ability to determine a scam “just by looking at the circumstances.” Huff’s diligence has saved the company the cost of a claim on a new truck. The reader is clued into the reality that this ability can go either way. By the end of the first chapter (7th page) Huff is alone in his office wondering what type of warning he’ll clip on the “accident policy” and what kind of “accident” his client’s wife will be. Language: Classic detective genre first person straight-talking guy. Clipped and clear. Every word serves its purpose. All unessential description removed. The provocative image of “The House of Death,” which rings of a newspaper headline, is placed alongside a relatively commonplace explanation of public liability insurance, yet each has weight and importance to the plot of this story. Setting: The Los Angeles environs are quickly established in the first few words, first by indicating that he drove to Glendale and then – and the period in history is also established – to Hollywoodland. In context of the L.A. basin he has moved from the working class suburbs to the playground of the elite. Los Angeles plays a significant background role as Huff peddles insurance from the coast to the foothills and every neighborhood in between. Character: While Huff is the main character and narrator of the story, Mrs. Nirdlinger provides a constant catalyst for the forward movement of the action. That the story is titled DOUBLE INDEMNITY clues this reader into the high likelihood of a double cross. As the story is told in the past tense, Huff directs the reader’s attention to events that place Mrs. Nirdlinger (and later her daughter) under suspicion from their first encounter. Structure (Rhythm, Tension): With it’s terse, immediately past tense style and frequent sections of present tense dialogue, the story seems to unfold in the moment that Huff tells it. It is easy to forget that the events he discloses (and some he neglects to disclose) have already happened and that the story is being unfolded at the narrator’s leisure. This rhythmic style puts the reader into the hands of a confident storyteller, even when the main character has trouble putting events together – or chooses to delay information that would make it easy for the reader to figure out the plot. Intention: This is well written literature regardless of the fact that it relies heavily on clichés from the detective genre style. It is entertaining and moralistic, but within this well defined and familiar structure the reader is given an excellent and entertaining read. Thematic Preamble: Absolutely none. Action begins with the first line and does not pause until the story is over. Nothing is given away or foretold. The narrative is offered as factual even when portions are delayed for dramatic foreclosure. Foreshadowing, Plot & Expectations beyond page ten: OK. I will admit that I couldn’t stop at page ten, twenty or even after several chapters. Even thought I am unaccustomed to detective genre stories, I could not put it down. As I was reading this masterful work, I considered how the narrator’s confidence in his ability to make a sale was both his strength and his downfall. It is clear from their first encounter that Mrs. Nirdlinger is hugely attractive and is a gigantic draw on Huff’s ability to focus. Even as he adopts an “I told you so” POV, the overall message from the opening pages is “cheaters don’t prosper” or “the piper must be paid” – and both these adages are upheld at the story’s conclusion. What kept me reading is that I expected a well-plotted scam to go well or to go badly and to be told with confidence and strength. 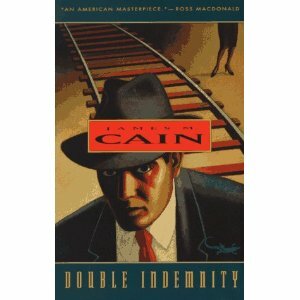 Random Comments: James M. Cain wrote THE POSTMAN ALWAYS RINGS TWICE (1934) and then immediately after DOUBLE INDEMNITY. He wrote MILDRED PIERCE in 1941.